Wendy, Václav Havel, Kv?ta Dienstbierová, Petr Pithart, William Luers and Karel Schwarzenberg gather at U sedmi and?l? restaurant at President Havel’s inaugural dinner hosted by the Luers and Miles Glaser on December 28, 1989 – the night before his swearing in as President of free Czechoslovakia. Wendy W. Luers is the founding President of The Foundation for a Civil Society (FCS) and Co-Chair of the Project on Justice in Times of Transition. 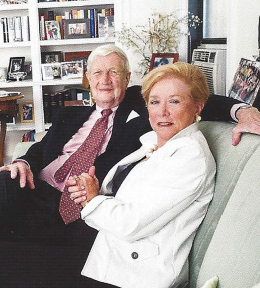 Mrs. Luers established the Foundation for a Civil Society in New York and Prague in January 1990. 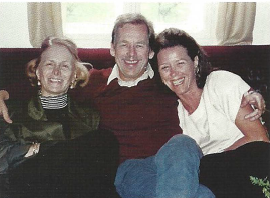 During her residence in Prague with her husband, Ambassador William Luers – a 30-year career Foreign Service Officer – from 1983 to 1986 they became close to Václav Havel and Charter 77. FCS helped promote civil society and provided ad vice and expertise with offices in New York, Prague, and Bratislava in the years after Czechoslovakia became a free state in 1989. Mrs. Luers is a pragmatic visionary, who uses her talents to solve problems and fill needs by guiding and inspiring members of her impressive network. Her skills at creating new institutions, identifying and mentoring dozens of highly talented young people, and mobilizing prominent leaders became indispensable with the Velvet Revolution and the Presidency of their friend Václav Havel. In 1990, and the years that followed she drew on her international network to collaborate with dozens of friends who virtually overnight had become the political and cultural leaders of a newly independent, free, and democratic Czechoslovakia. They trusted Wendy and Bill and needed her. Wendy worked to link hundreds of creative Americans with Central Europeans who made a practical difference in the transition from communism. One of those creative Americans recently wrote, “Wendy threw her trust behind a bunch of kids. With her guidance and interminable energy, we helped create something that had a direct impact on countless lives.” Today, Wendy lives and works in New York City with her husband. Beyond starting the Foundation for a Civil Society, she has also gone on to help establish the Foundation for Art and Preservation in Embassies and the Václav Havel Library Foundation. She was the first woman and first non-Czech to receive the Gratias Agit award from the Minister of Foreign Affairs of the Czech Republic. Here, Wendy shares her story of getting to know Czechoslovakia; its peoples, and the vital role she would play in the democratization of a newly freed nation. Wendy, thank you for making time to share your story with us. Tell us where the story begins. It all started in 1983 when Bill and I and our children and dogs arrived in Prague in December for Bill to become the American Ambassador to Czechoslovakia. I had worked as a journalist and for Amnesty International and Bill, a career diplomat, was a Soviet specialist and had been in charge of Eastern Europe as Principal Deputy Assistant Secretary for Europe. l had never been to Czechoslovakia at this point. It was very dark and very gloomy and very communist. Yet the Ambassador’s Residence, the Petschek Palace with 65 rooms, was absolutely fabulous. From our backgrounds, we knew that we wanted to do several things with cultural diplomacy while in Czechoslovakia. We wanted to meet the most interesting people in the country, who were, of course, the dissidents. These ideas were not U.S. government policy. They were personal decisions on both of our parts. We were bringing an absolutely marvelous collection of paintings that were lent through the Art in Embassies program, some from good friends. Luckily we have a number of very famous friends who are writers and painters – John Updike, William Styron, Frank Stella, Edward Albee, Arthur Miller. We wanted to invite them to come to Prague to visit us. They weren’t coming as official State Department guests. We just wanted to, as best as we could, have normal everyday Czechoslovaks exposed to these people, even though the communist government didn’t want us to. And we wanted to show them Czechoslovakia and have them meet their counterparts. The same thing happened with museum specialists and curators. We started collecting the names of interesting people – both dissidents and others – who worked in cultural institutions so that we would have a chance to invite them all to our residence. And the Czechoslovak government let them come. 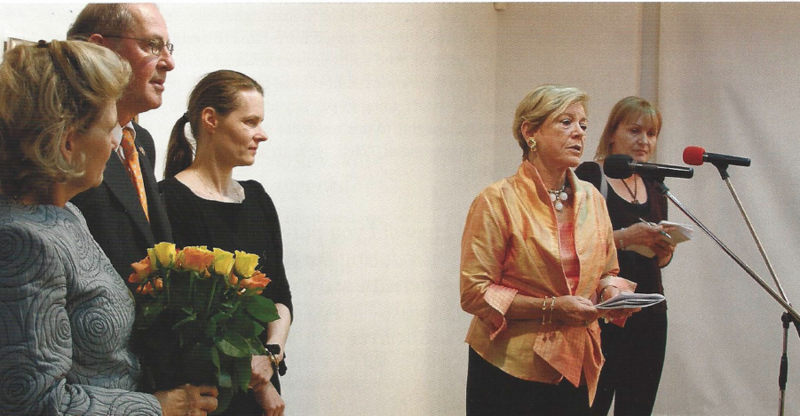 Wendy speaking at the opening of The Foundation for a Civil Society joint international Young Visual Artists Awards (YVAA) exhibition at the Slovak National Gallery in 2011, with the US Ambassador Tod Sedgwick and his wife Kate. Part of the Young Visual Artist Awards Program, the exhibition brought together artists from the ten different countries from Centra! and Eastern Europe and the Balkans. It seems like a somewhat dangerous effort. How did you go about getting to know these people? Incredible! How did you put your plan into action in terms of introducing the people of Czechoslovakia to modern American art? We had gone to the Museum of Modem Art’s lnternational Council and asked them to send us in Prague all the catalogs that their members were receiving from galleries and museums. We did this so the underground artists and unofficial artists in Prague, who were not allowed to go into the libraries because they weren’t members of the Artists Guild, could see what contemporary art was in the United States at the moment. The first big event we hosted was in February 1984 when we had a vernissage of the art that was on loan from great American artists. We invited all these people but we didn’t know if these people were going to be able to come. We also invited all the official people from the Ministry of Culture and the official heads of all the arts organizations. At first, none of the invitations were delivered by the post office until my husband had the Embassy drivers hand deliver them. And all of a sudden, they were all delivered throughout the country. But we still didn’t know if the non-official people were going to be able to come because they would have to ask permission to come see us, the enemy. Twenty minutes before 6 p.m. we ran out of hangers because we had 200 some people there. It was a huge success and that was the beginning of our two and a half years in Prague. What followed in those two and half years? We traveled all over the country. We met everyone we possibly could. We brought all of these very famous writers and painters and sculptors and poets and traveled around the country introducing them to their counterparts. 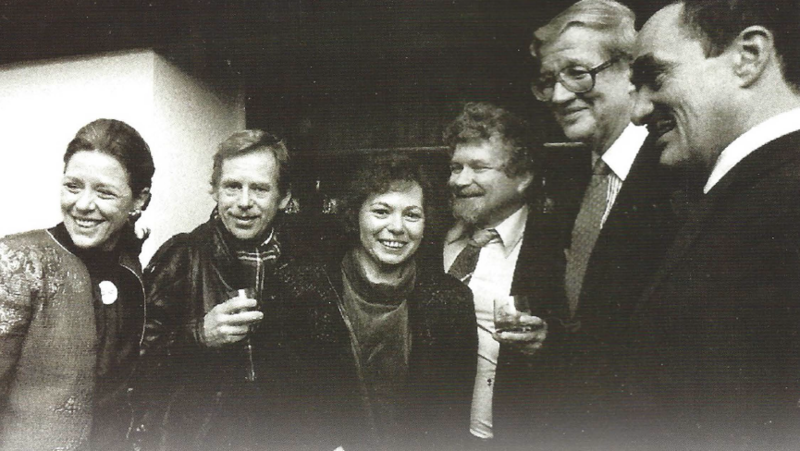 We also became very close to Václav Havel and his wife Olga, and his brother Ivan Havel and Dáša his wife. In 1986, Bill was named the president of the Metropolitan Museum of Art and we left Czechoslovakia. But we knew we’d have to continue to go back and see them in Prague because they didn’t have passports. And so we went back every year. We’d fly in and give a dinner at The Seven Angels in Old Prague; we’d invite all our friends and the Havels. They’d all come and it would be a great reunion for us. Of course we’d be surrounded by StB agents, whom we couldn’t see but our guests all knew they were there. So you weren’t living in Czechoslovakia when the Velvet Revolution happened? No, in 1989 when the Velvet Revolution happened, we were in New York. I was working for Human Rights Watch. But once the wall started to come down we were really staying in touch constantly with what was going on. We actually flew over on Christmas Day to Prague to give the same dinner we’d given every year. The dinner was held on December 28, 1989 and it turned out to be Havel’s inaugural dinner the night before he became president! We gave the dinner with our friends who were now going to be the President, Lord Mayor and Foreign Minister. It was extraordinary! The next day we went to Havel’s inauguration in historic Vladislav Hall at Prague Castle. There are many long wonderful tales. One of my favorites is that Havel understood that communism was brown and drab and gray. So he had artist and costume designer Theodor Pišt?k create these blue and red uniforms with epaulets for the marching band. All of the people lining the path to St. Vitus Cathedral were students instead of guards with machine guns. lnside, there was all this press from across Europe. Cardinal Tomášek, whom we’d seen a great deal of as he was very helpful to the opposition, was well into his 90s. Olga and Václav were sitting in their chairs in front of the altar. Bill and I were in the front row next to the Minister of Defense who was a communist general and still had his uniform on. After Dvo?ák’s Te Deum, all the dissident priests picked up Cardinal Tomášek and brought him down to greet his president. We all had tears streaming down our faces and so did the Minister of Defense. What an amazing moment of history to have been a part of! What happened when all the fanfare are was over? Wendy Luers (right) with Polly Kraft and Václav Havel at Hráde?ek in the summer of 1989. On the 1st of January 1990, the new Deputy Prime Minister, Ján ?arnogursky?who had gotten out of prison two weeks before, invited us for lunch at his residence in Prague. He turned to me and said “Wendy I would like you to help us with the new constitution of free Czechoslovakia.” I said, “How could I possibly? I’m not even a lawyer. But l know somebody who would be delighted to help.” Lloyd Cutler, who was general counsel in Carter’s White House and later in Clinton’s White House, was one of the leading lawyers in the country. He and his wife Polly Kraft (see photo) had traveled with us to Hráde?ek, Havel’s country home, in 1989 when he told Havel that he would do whatever he could to help. He was thrilled when I asked him if he’d help with the new Czechoslovak constitution. And so we created the Constitutional Project. Lloyd and a constitutional expert and American University Law School Professor named Herman Schwartz brought together leading experts from all the parliamentary countries in Europe to consult with the people in the Czechoslovak Parliament drafting the constitution. In the meantime, Bill and I had come back to the United States. The Ford Foundation had called together a meeting (around January 10, 1990) and had brought together all 50 people across the United States who were really interested in Czechoslovakia, including George Soros and Bill and me. We briefed everyone else on what was going on over in Czechoslovakia. Bill and I realized that we were probably among a handful of Americans who had ever really known these dissidents. Everyone at the meeting was saying that we need a point of contact. George Soros was sitting next to my husband at lunch and the next thing I knew at an afternoon meeting he said, “I’m giving Wendy an office and a secretary.” He never discussed it with me. So Just like that you were the point of contact? Yes. The next day I went over to George Soros’ office and picked up paperwork for an independent 50l(c)3 registered in New York as the Charter 77 Foundation, which George used to funnel funds to the dissidents. I didn’t know how to run a non-governmental organization (NGO). I had been working as a journalist and writer and in human rights organizations. So we just started it. All of our founders – the Ford Foundation, the Rockefeller Brothers Fund, Pew Charitable Trust, the Rockefeller Family and many others – were key,helping us in every possible way. We opened offices in Prague and New York. Whenever we identified a need, I would go to them, especially Bill Moody at the Rockefeller Brothers Fund, and they would help frame the proposal. Early in 1990, we helped people like Havel organize their offices as they had no experience. And we organized the New York portion of Havel’s first trip to the US in February, 1990 as President of Free Czechoslovakia. More about that later. How did you keep up with the growing demands on the organization? I never hired anybody that wasn’t at least 20 years younger than I was. The whole idea was that as we created various programs to help the whole democratization process, you didn’t want to hire people who would intimidate the Czechs and Slovaks, who didn’t have the exposure or the experience. The individuals I hired would live on the economy and already spoke the language or they learned it very quickly. Then when the country split we immediately created an office in Bratislava. At one point we had 50 people in three offices in three countries. That is a lot. ln addition, I was the wife of the president o? the Metropolitan Museum of Art which entailed a lot of entertaining. I went to Prague and Bratislava 75 times during those years. lt was a bit of a blur. So what were some of the programs you created? and they went for a month or two months. They had no textbooks. They would basically teach out of magazines or just have conversations four days a week. The Czech and Slovak students’ responsibility was showing the American students Czech history, Czech beer drinking, and such. What happened is that we created 450 friends of Czechoslovakia over those years. 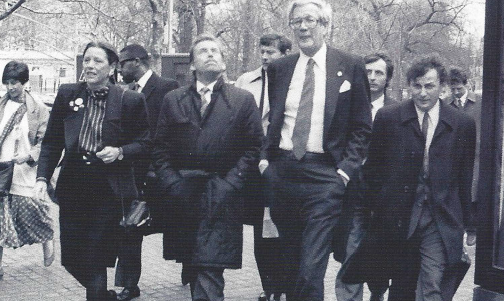 In February 1990 we organized Václav Havel’s trip to New York. Madeleine Albright organized the part of the trip to Washington D.C. where Havel spoke in front of the joint sessions of congress. While he was in New York, it was like bringing in the Dalai Lama, Jesus Christ, and Mick Jagger all wrapped into one. Everyone wanted a piece of the action. He saw the mayor, major playwrights, and the New York Review of Books organized a fabulous dinner. There were 2,200 plus people in St. John the Divine to hear him speak, which was also broadcast on PBS. It was an extraordinary time. We also started the Democracy Network. Having been an ambassador’s wife, I understood that there is a team in the Embassy who know a great deal about the country where they are serving – politics, economy, culture and history. The United States Embassy had been open throughout the communist period but there was no assistance program of any kind. So by definition the USAID people had no experience in Czechoslovakia. I wrote a memo in late 1992 to Brian Atwood, the incoming head of USAID for President Clinton. I said, “I understand that there is talk of democracy institutes in Eastern Europe and I think we need to discuss this and talk about a small grants program that can get down into the grassroots and that can utilize the experience of the actual Embassy and the Ambassador.” He called me down to Washington and what came out of it was called the Democracy Network which is now all over the world in many emerging countries. lt was basically a small grant program which was run by USAID and the embassy team. We had Cooperative Agreement # 1 for Czech Republic and #2 for Slovakia, so we created the model. What we did was provide small grants to fledgling nonprofit organizations that had no idea how to create a board, a budget, and checks and balances. Many times we rejected their first attempts but helped them improve and refine their proposals. This is what building a civil society is about. lt was real on-the-ground training. What other programs did you establish? 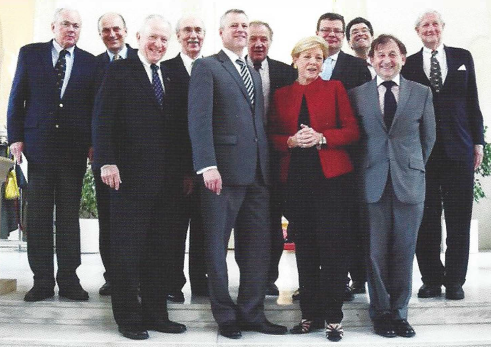 ln October 2011, Wendy organized a symposium titled “The Lion and the Eagle: Czech-American Relations through the Eyes of Envoys” held at the Foreign Ministry in Prague, Here she is pictured with the former and current Ambassadors to/from the Czech Republic. (Left to Right-Front Row) Ambassador William Cabaniss, Ambassador Petr Kolá?, Wendy Luers, and Ambassador Michael Žantovsky. (Left to Right – Back row) Ambassador Craig Stapleton, Ambassador Petr Gandalovi?, Ambassador John Shattuck, Ambassador Martin Palouš, Ambassador Alexandr (Sasha) Vondra, Ambassador Norm Eisen, and Ambassador William Luers. Americans to provide expertise and advice to the Czechoslovak officials. Our grantees earned a maximum of $50,000 a year (which included salary, benefits, travel, schooling, and housing) and had to commit to live in Czechoslovakia for at least a year. This was a fraction of the USA ID experts who could earn as much as $1,000 a day This way they knew they were receiving unbiased advice. We also provided an architect and an urban planner to the Architect of the City of Prague because the Germans and Austrian were coming in droves trying to put neon signs up in Wenceslaus Square for their casinos and as well as advertising and billboards in the beautiful historic center of Prague. There was neither zoning nor anything that would stop this through the Czech government. So we helped them start working on master plans and zoning to preserve Prague and design a reasonable infrastructure. Really, what we were in those days was very demand-driven. Where there was a need we did our best to fill it with the enlightened founders. We also knew perfectly well that there were incredibly talented students in the gymnasiums (high schools) who had never traveled. We provided HIV/AIDS education materials to all the teachers at their request as there was an AIDS epidemic but the government was denying it existed. The response from the teachers was overwhelming. We also realized there were no student councils or student newspapers or PTAs. There was no democracy in the schools. So we went to Lawrenceville and Andover, two great prep schools in the United States, and started our Secondary School Program. Over five years, we brought 120 high school students who had been selected from hundreds of applicants to study for a year with a full scholarship at leading independent boarding school in the US and UK. When they went back to the Czech Republic and Slovakia they had to start a student newspaper or student council. One of my favorite stories related to that program just happened. We organized a Václav Havel Library Foundation sponsored gala last November, when the bust of Václav Havel went into the US capitol. The Speaker of the Assembly in the Czech Republic, Jan Hamá?ek, gave his remarks in English at the opening of this gala for 450 people in Washington D.C. Then he came up to me afterwards and said, “Wendy, you don’t know this but you changed my life.” And then I said, “What are you talking about?” And he said, “You sent me on a scholarship to England when l was a student.” So there you are. There’s a legacy from all these programs. Yes, tell us more about the legacy which exists today in the Czech Republic and Slovakia. So I had offices in Prague from 1990 to 1998 and an office in Slovakia from 1993 to 1999. Nadace Via (Czech Republic) and Nadácia Pontis (Slovakia) are the successor NGOs and affiliates of The Foundation for a Civil Society, which still operates today in New York City Via and Pontis are the leading NGOs in both countries. Via was just able to raise $750,000 locally for an endowment which is now close to $3 million. They have 25 people working there. At Pontis, they have raised over 30 million Euros and have something like 40 people working for them. They are just amazing, both organizations, of which l am very proud. When and why did you decide they needed to become their own organizations? to Eastern Europe. They knew how to raise money already because they had been doing it with me. They knew that they could do it and they did. They are just fabulously wonderful people. They are the greatest legacy of FCS. The Foundation for a Civil Society’s principal activity today is the Young Visual Artists Awards (YVAA) which was established in 1989 by Václav Havel and a group of artists as the Jind?ich Chalupecky? Award in Czechoslovakia. lt has inspired similar awards in nine other countries, the winners of which come to New York for residencies. Another outgrowth of The Foundation for Civil Society was my helping to co-found the Václav Havel Library Foundation three years ago to collaborate with his Presidential Library in Prague. We are partnering with the Presidential Libraries in the US after which his is modeled. Did you have any idea all those years ago when you arrived in Czechoslovakia as an ambassador’s wife that you’d have the impact you’ve had today? Of course l didn’t know! And i?s important to underscore the fact that nobody knew the Velvet Revolution was going to happen or that the wall was going to come down. We had no inkling. The Velvet Revolution was November 17th and on November 18th the Washington Post called Bill, who was then president of the Mel, and asked him to write about the Velvet Revolution. We called the Havels. At the time Ivan Havel and Václav Havel shared quite a small apartment with their wives in a building built by their grandfather. Ivan answered the phone and Bill asked what’s happening. He said nothing is happening – call back in a couple of months. But then, of course, it all began to happen. Really, the short answer is that we knew we were never going to forget this country; that we were always going to have ties to it, having no idea that it was going to become free. What are you most proud of in all your years of working to help the people of the Czech Republic and Slovakia? I said, “Just go do it. Just ask.” I had to delegate by necessity. But by delegating to these talented young Americans and to these talented young Czechs and Slovaks who chose to work for change, it meant that they had the capacity to sustain these two great organizations. That was the greatest lesson I learned and the greatest legacy. And none of this could or would have happened without the extraordinary help of the foundations and individuals who counseled and funded and guided us as well as the loyal and committed Board of Directors of FCS over the past 25 years. To learn more about Wendy Luers and The Foundation for Civil Society visit www.fcsny.org.